Compared to its predecessors, the Chromecast Ultra has three new tricks: 4K HDR streaming, shorter loading times, and an ethernet port for wired connections. If you’re comfortable with how Chromecast works already, that’s pretty much all you need to know. The $69 Chromecast Ultra does what it claims to do, while preserving all the benefits—and the flaws—of the $35 model. The bigger question, then, is whether anyone needs a premium Chromecast to begin with. 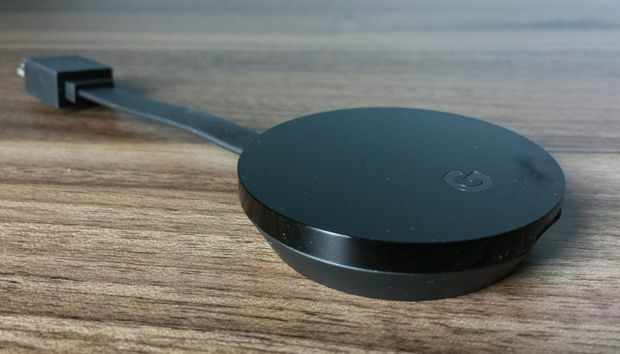 As with the original Chromecast (and its 2015 refresh), the Chromecast Ultra doesn’t include a remote control, and there are no menus to navigate on your television screen. Instead, you control all of the action through your phone, tablet, or the desktop Chrome browser. After a super-simple setup process, apps and websites that support Chromecast—such as Netflix, YouTube, and Hulu—will automatically display a “Cast” button, which lets you launch videos and music on your television screen. To play a video on Chromecast, press the Cast button (top right) in a supported mobile app such as HBO Go. Beyond music and video, the platform supports lightweight games, such as a big-screen version of Monopoly, along with more novel apps such as presentation tools and photo viewers. You can also mirror the display from an Android phone or desktop websites in Chrome, though this drains your device’s battery life and the streaming quality is unreliable. Chromecast’s reliance on a second screen isn’t for everyone, but the brilliance of this approach is that it doesn’t require overly powerful hardware on the Chromecast itself. Your phone or tablet already has a capable processor for navigating apps, plus a software keyboard and voice microphone for search; the Chromecast just needs to be fast enough for streaming video. While other some older streaming-TV devices are becoming too slow for modern video apps, even the first-generation Chromecast feels nearly as capable in this respect as the new Chromecast Ultra. Behind the TV: Chromecast Ultra and the original 2013 Chromecast (right). The big difference with the Ultra is 4K HDR video support, though you might not know it from using the product. Currently, the only sources for 4K video are Netflix, YouTube, and Vudu, and only Netflix supports HDR. Amazon Video, a major source of Ultra HD video, is unlikely to arrive on Google’s devices due to long-standing unpleasantness between the two companies. Pixel count and quality aside, Chromecast Ultra does benefit from a beefier processor than its predecessors. Google says the new hardware is roughly 1.8 times faster, and in my experience the Ultra shaved off about five seconds in load times. This varies by app, but you can generally expect videos to start playing within eight to 15 seconds after you’ve hit the Cast button and pushed play. The new hardware also includes an ethernet port, which is built into the power adapter rather than the TV dongle itself. The placement makes sense for keeping cables hidden away, though it does preclude users who want a hardwired network connection (perhaps because their Wi-Fi is too slow for 4K streaming) from connecting the Chromecast directly to a television’s USB port for power. The Chromecast Ultra’s power adapter includes an ethernet jack for wired Internet connectivity. The biggest problem with Chromecast’s phone-as-remote approach is that it doesn’t always feel like a complete solution. 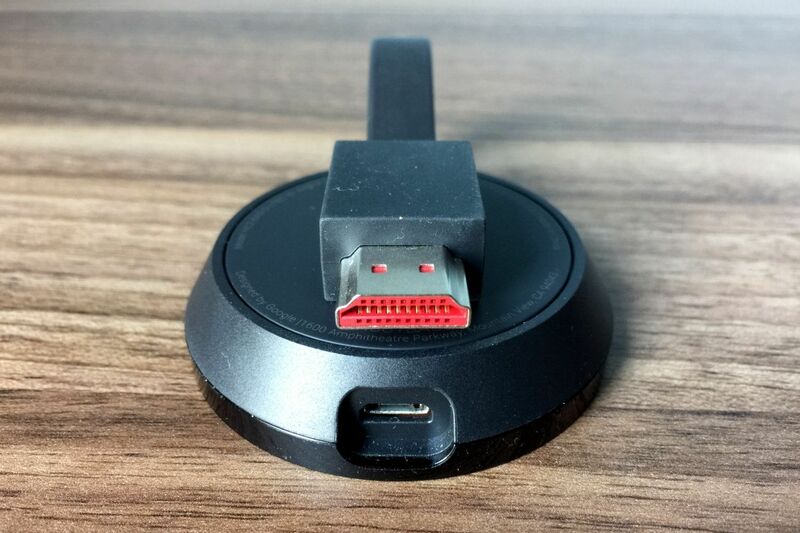 Although Chromecast can turn on your TV and switch to the correct input when you start casting, thanks to HDMI-CEC, volume controls from your mobile device are inconsistent. Some apps let you adjust volume with your phone’s hardware buttons, while others only offer an on-screen volume slider, or omit volume controls altogether. Android phones can control volume in some apps from the notification bar, or with physical buttons when the phone is locked, but iPhones cannot. YouTube lets you adjust volume straight from the notification shade. HBO Go does not. Volume controls aren’t the only area of inconsistency. Chromecast’s playback controls also vary from one app to the next, so you’ll get some apps with convenient 10-second rewind and fast forward buttons, and others with only a progress slider. And without a dedicated remote, there’s no one-touch access to voice search like you get with Apple TV, Amazon’s Fire TV, and certain Roku players. Chromecast has fallen behind rival media streamers on the little things as well. It doesn’t support private listening through Bluetooth headphones or your mobile device’s headphone jack, and there’s no captive portal support for use with hotel Wi-Fi networks. The one area where Google has made measurable progress is with browsing and searching across disparate streaming services. With the Google Home app for iOS and Android, you can browse a list of trending videos across all the Cast-enabled apps you’ve installed. You can also search by title, actor, director, or genre; or put together more complex queries, such as “alternate history movies” or “dramas with Bill Murray.” Selecting a result brings up a list of streaming services where the movie or TV show is available. Universal search is one of the strong points in the Google Home companion app. But even the Home app could use improvement. There’s no way to cast videos directly from this app, so after making a selection, you’ll waste a lot of time launching the corresponding app, then hitting the Cast button, then waiting for the video to load. And on occasion, Google’s search delivers bogus results. It seems to think, for instance, that the Netflix exclusive House of Cards is available on Hulu. The app also doesn’t help at all with finding 4K HDR video. So while Roku players include a handy “4K Spotlight” app, and Amazon’s Fire TV marks Ultra HD video on the home screen, you’re on your own with Chromecast. I have a soft spot for Chromecast because the core Google Cast technology is so elegant. Launching a video from your phone or tablet has worked flawlessly from day one, and compared to Apple’s AirPlay, Google’s second-screen approach has fewer compromises. You can still take a call or play audio on your mobile device while Casting, and media playback continues even if you disconnect from the Wi-Fi network. That said, the standard-issue Chromecast is a strong product in part because of its price. Unlike other sub-$40 media streamers, such as the Roku Express and Amazon Fire TV Stick, Chromecast is immune to performance hitches, provided you have a decent phone to browse with. It’s the rare low-cost device that’s also future-proof. Those benefits are less pronounced at the higher end of the streaming-device market, where Chromecast’s competitors have more horsepower. Sure, the Chromecast Ultra is cheaper than most 4K streamers, but for the same $70 price, you can instead get Xiaomi’s Mi Box, an Android TV set-top with a proper remote control, 4K HDR streaming, and Google Cast built-in. Alternatively, you could spend $20 more for the Amazon Fire TV, a 4K streamer with a smart interface and Alexa virtual assistant. And if you really care about 4K HDR, the $100 Roku Premiere has by far the best selection of content.